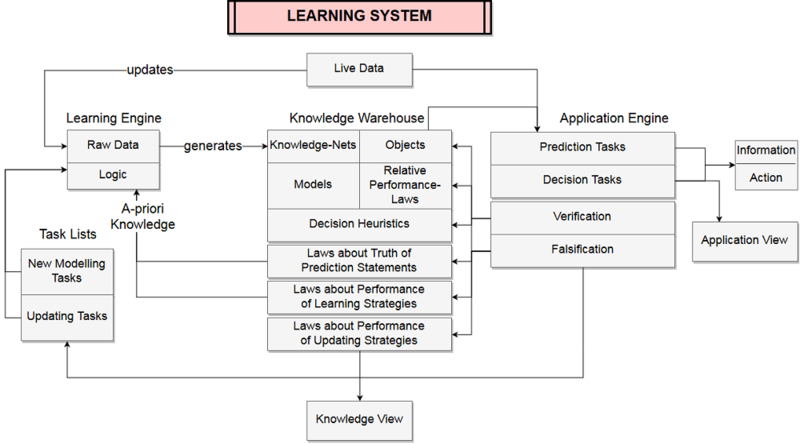 To demonstrate the way a learning system works we show a graphical representation of a set of laws and their continuous evaluation. We call this kind of representation a “WorldView”. It is an example that displays the development of laws about the loan portfolio of the peer-to-peer lending company Lending Club (122,444 loans). We searched for emergent laws about the return and the PD (probability of default) in the first 100,000 loans. What we found is a set of rules to select loans on the marketplace operated by Lending Club, related to which a multitude of until now always-true statements about the above-mentioned properties of loans were attached. The result is shown in the below “movie”. The “movie” shows an up to this point always-true Worldview defined by a prediction horizon of TP=15,000 loans, and the properties of a credit portfolio which are relevant for decision making. Investors can find dominant strategies to select loans. All objects in the top right corner always had a higher return than the average and a higher return than the average of the respective rating class. This result shows that there are recurring “errors” in the pricing-system of lending club. The point in the respective cuboid represents the current state of the objects for all depicted dimensions. As soon as the movie has started and as time passes, the current state (point in the respective cuboid) is mostly located inside the correct and therefore future expected intervals. It can also be seen that sometimes the learning system “adapts” its conception of the world. For some properties this behaviour was allowed. But for every point in time the movie shows the current state of decision relevant properties of Lending Club’s database that were always true. No object disappears over time. This will happen, if one of an object’s important properties is falsified by new observations. We also see that the Worldview is pretty stable. Especially the dominant strategies (top right corner) remain dominant all the time (compared to the ones in the bottom left and bottom right). We should remark that the decisions made by our learning system often contradict the currently used decision rules derived from traditional theory of decision making under risk. Nonetheless it would have been always profitable to follow the decisions made on the basis of T-Dominance.